Founded by Christina Bellini-Zaher, MS, OTR/L, The Therapy Center for Children is a "placement agency" composed of licensed and experienced pediatric physical therapists, occupational therapists, speech therapists and special educators. Our number one priority is to match your family with a compatible therapist. Over 30,000 children from birth to three years are receiving Early Intervention (EI) services in New York State. We hope this handout will help pediatricians to integrate the EI process and the resulting services that their patients and their families receive into their medical practices. We hope to make it easier for the primary care practitioner (PCP) to refer patients with suspected or confirmed developmental delay to EI, as well as to follow up in their care throughout the course of the intervention. Below is the link to available waivers available in New York. awareness outside the Down syndrome community by continuing working with local colleges and with Down syndrome organizations in a collaborative effort to promote a better understanding of people with Down syndrome. Alexander's Angels aims at presenting the person with Down syndrome for what he/she is, a person with feeling and abilities much like anyone else. To that end Alexander's Angels aims to organize events that showcase to the community-at-large special talents within the Down syndrome community. The Down Syndrome Association of Central New York, Inc. is a group of parents, family, and friends of individuals with Down syndrome. We are located in and around Syracuse, New York which is part of Onondaga County. Our membership extends into the surrounding counties such as Madison, Cortland, Cayuga, Oswego and Oneida. Their purpose is to support one another in the challenges we face; to educate the community both in its knowledge and perception of Down syndrome; to advocate for their children and to be available to other parents. The Down Syndrome Association Hudson Valley, established by a group of parents in the 1980s, is a volunteer driven organization created for local families. We wish to see our children and adults with Down syndrome live fulfilling, empowered lives and strive to meet the individual needs of each family. The mission of the Down Syndrome Association of Westchester is to provide information, support and assistance to individuals with Down syndrome and their families. DSCLI is a parent-run, volunteer organization made up of families and individuals touched by Down syndrome. They are an affiliate of both the National Down Syndrome Society and the National Down Syndrome Congress. They are proud to be partners with Good Samaritan Medical Center. Together, we will be presenting a series of informative meetings. Good Samaritan’s Center for Pediatric Specialty Care is committed to providing the finest pediatric sub-specialty care to the Down syndrome community of Long Island. DSPG seeks to enhance the lives of people with Down syndrome and their families. The organization's informational and social events provide a broad range of opportunities for families to support and encourage each other. The Down Syndrome Parent Support Group is a nonprofit organization consisting of parents of children with Down Syndrome. 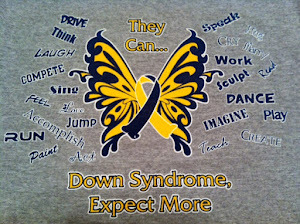 Its purpose is to bring a greater acceptance and understanding-of Down Syndrome. The organization's mission is to make opportunities available for persons with Down Syndrome to engage productively in community life. family fun raising and Down Syndrome awareness event in Lewiston , NY. The mission of the Flower City Down Syndrome Network is to provide education, support, and opportunities to people who have Down syndrome, and their families, in the Greater Rochester area. The Franklin County Down Syndrome Society was established in support of individuals with Down syndrome and their families in Franklin County, New York. Our mission is to raise awareness of Down syndrome in our community, to support individuals with Down syndrome and their families in our community emotionally and financially, to increase the quality of life of individuals with Down syndrome in our community, to support research that strives to increase the quality of life of individuals with Down syndrome, and to promote a positive image of individuals with Down syndrome. Pathfinder Village is a home where people who have Down syndrome and other disabilities discover their own value and talents, and share these gifts with others. It is a friendly, beautiful community where residents become involved and find opportunities. The Village opened in 1980 with seven homes and a school. Since then, the Village has added more homes and programs. Residents are valued for their abilities and contributions. They are encouraged to choose friends and develop goals. The Down Syndrome Information Network is dedicated to increasing community awareness about the potential and needs of people with Down syndrome. Mission is to empower children and adults with developmental disabilities to achieve their potential based on personal choices, abilities and interests.